I never did it, count down the days to Christmas. I used to get excited that Christmas was on its way but never conciously counted down. Isn't that strange? I never had an Advent calendar when I was small either, in fact I have never had an Advent calendar EVER! My children did once ore twice when they were very small but it was always used as an extra form of punishment - as in "you've been naughty so no advent calendar for you tomorrow" and then the chocolate would go to their father. I soon learnt not to give him extra weapons. When we set up home with Mr M they had an Advent calendar each! and to their surprise it was never used for anything other than counting down to Christmas. I suppose it is because my ex died at the beginning of this year and watching my daughter coping with her grief has unleashed a lot of memories so I am allowing the shutters on that part of our lives to come down a little. 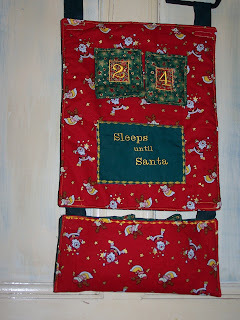 Now that Miss M is 6 she counts the sleeps until Christmas and I made a wall hanging a couple of years ago that does just that. 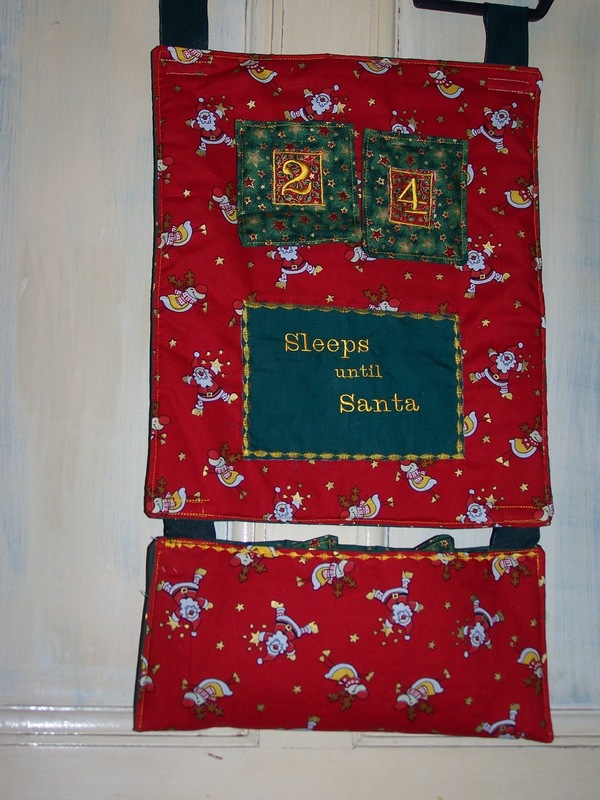 So now she has an Advent calendar, a snowman clock in the garden and the sleeps until Christmas wall hanging. The pocket at the bottom holds the numbers and I embroidered the numbers and text with my brother embroidery machine. It hangs on the sitting room door so that Miss M can pop in on her way home from school, or she can see it when I collect her, and she can change the numbers every day.